…does it actually happen? Kenneth in the (212) points out the surprisingly bare stands at the recent Match of the Modern Masters sponsored by Talon Air. Yikes. Why was no one watching? Perhaps fans just couldn’t take a Thursday off, and instead chose to watch this exhibition online? For Sampras’ sake, let’s hope it’s the latter; he’s got a few more matches slated through the end of the year. It’s too early in his retirement to already be overexposed. Buy: As usual, you can visit the Guga Kuerten website to buy any of the clothing. Steffi steps up: I pooped my pants yesterday when I read that Steffi and Justine Henin will be playing in an exhibition match in October to benefit Graf’s charity, Children for Tomorrow. I won’t be going to Mannheim, so someone post it on YouTube, ok? Their post-tennis business ventures: This Bloomberg story goes over all their major projects, including San Francisco restaurants, furniture lines (with Kreiss), and real estate. The latest? A Fairmont Hotel near their Tamarack Resort in Idaho. adidas collection – SALE: OTB tips us off about a sale at adidas for its Andre Agassi collection. Check out the goods and tell us what you think. >> agassi’s memoir, tamarack resort, etc. Tattoo Watch: Austrian player Stefan Koubek‘s lower back tattoo spotted at the practice courts of this year’s Mercedes Cup in Stuttgart, Germany. Above is the visual merch layout for Guga Kuerten‘s Florianopolis store. This rollout was for the line’s Summer ’07 collection. More interior design photos here. short balls: alexandra stevenson should retire, orange county represents, how young is too young?, etc. The Fed Cup Chronicles: Down the Line! has been following the buzz sourrounding Sharapova and the Russian Fed Cup team, in case you were wondering. More O.C. : Villa Park’s Lindsey Nelson entered the qualies at last week’s Bank of the West Classic, losing in the second round. I heard she had a quad injury, so I’m glad to see her playing. (OT) In architecture, rise and fall: The Burj Dubai is already the tallest skyscraper in the world and it’s not even completely built. In Johannesburg, Ponte City (above) — the southern hemisphere’s tallest residential skyscraper and an excellent example of brutalism — gets a second wind. Also, the Washington Times mourns the demise of sketching as a trade practice. (OT) Adding to things my countrymen — and one country..err woman — are known for: Surely you’ve seen these awesome performances from a jail in Cebu. Retired American MaliVai Washington returns to competitive tennis at the Gibson Guitar Champions Cup. Since retiring in 1999, he has devoted some time to his MaliVai Kid’s Foundation, which will hold its 11th annual fundraising gala this September. Below he talks about joining the Masters tour, his appearance in the 1996 Wimbledon final, and the Davis Cup injury that ended his professional career. Q: How do you feel about making your Outback Champions Series debut? MaliVai Washington: Making my debut in the Outback Champions Series will be exciting. It’s a chance to get back out on the court having been away from competitive tennis for several years. The funny thing is that the draw will look just like it did when I was on tour full time. These are the guys I won and lost against my entire career. Q: You had knee problems at the end of your career stemming from a heroic 1997 (first round) Davis Cup win in Brazil against Gustavo Kuerten. Tell us about that match, what happened to your knee, and how your knee feels now. MW: Playing Davis Cup for me was always a great honor. Unfortunately, I played just three times in my career. There were a few Hall of Famers named Sampras, Courier, Agassi, and Chang, who where going to be asked to play ahead of me so it wasn’t often that I got the chance to play. Beating Gustavo in the opening match was one of my top three or four career highlights. A combination of the occasion, being in Brazil in front of a pretty hostile crowd, and playing the opening match, was very special. Finishing the match with a knee injury where I had sheared off a piece of cartilage made it more painful but more satisfying. Ironically, that was a career highlight but it was also the beginning of the end of my career. I just didn’t know it at the time. Today, my knee feels ok, but I doubt if it will ever be 100 percent. Just the nature of my injury hasn’t allowed me to play as much tennis over the last few years as I’d like and I certainly haven’t competed against guys like this in years so I too am interested to see how my body holds up. Q: It has been nine years since you retired from the ATP tour. How will it feel to play matches again? MW: Playing competitive tennis is such an adrenaline rush for me so it will be great to get on the court and compete. I just wish I could do some of the things I use to do on the court well. I can still do those things today, I just can’t do it as often. Q: You had two great grasscourt achievements in your career: coming back from 1-5 in the fifth to beat Todd Martin in the semis of Wimbledon in ’96 and playing Richard Krajicek in the final. What are your memories of those matches? MW: At the time, I would have never guessed that (those matches) would be my last ever at Wimbledon; knee injuries and surgeries didn’t allow me to play again. Coming back from 1-5 down in the fifth set against Todd was one of those things you can’t explain. In the course of a year, every player loses a couple matches that they should have probably won, and on the flip side, win a couple matches (they) probably should have lost. The win against Todd was won of those matches. For me it was a great highlight and win against a great player. Being in the final of a major championship is what you dream about as a kid, but you never dream of getting second place. On that day, the better player won, but those two weeks in London and playing on the final day was the pinnacle of my career. Q: What are your feelings of Newport and the International Tennis Hall of Fame as a destination? MW: Newport is such a wonderful city to visit and the Hall of Fame is such a nice venue to have an event. My last trip to Newport was in the summer of 2006 for the Gullikson charity event… I have special memories of the Newport because Mark Stenning, the Newport Tournament Director, gave me my first wild card back in 1989 before I had even turned pro, and he again gave me a wild card into the tournament 10 years later when I was at the end of my career, post-two knee surgeries. Needless to say Newport was very special to my career. More Guga goods from www.popbr.biz, including a camo line (fun briefs!) and one inspired by lotería (aka Mexican bingo) below. trophies: indianapolis, umag, austria, stanford, rio, etc. Pictureless: Italian Francesca Schiavone won her first career title in Bad Gastein, but we are without pictures. Congrats, Francesca! In Umag, veteran Carlos Moya tells us not to write him off just yet with his 6-4, 6-2 win over Andrei Pavel. 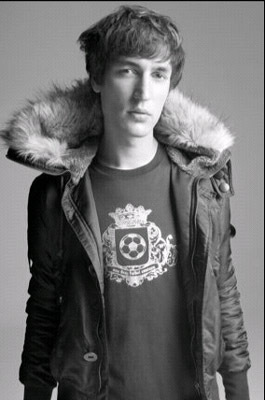 Gap-toothed or not, he’s still hot. And kudos to the tourney organizers for coming up with that offbeat blue trophy. A few notes to start: Vice‘s annual photo issue is out, so make sure to pick up a copy before they disappear. Also, perfect Sunday afternoon = surprisingly potent Chipotle margaritas while window shopping at the Bev Center. 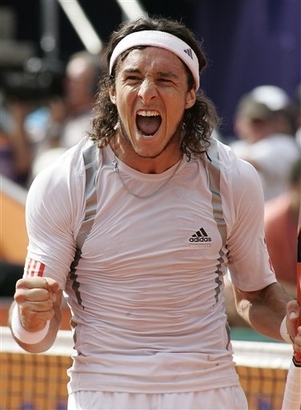 Did anyone else notice how Juan Monaco was BURSTING out of his adidas kit while playing Potito Starace in today’s Austrian Open final? The world is totally unfair. Fashion: I love the silver trim on these shirts (both in red and white). I’ve been trying to look for it online to no avail, so if you have any tips, please send our way (tennisCBH AT gmail DOT com). Bonus round: More pics of the white shirt, some Monaco training pics, and a screenshot. Enjoy! Here are some more looks from Guga Kuerten, the eponymous fashion line of the Brazilian tennis star. 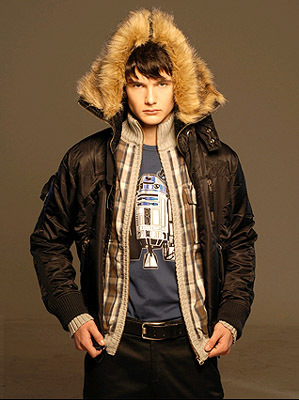 That’s the spring/summer ’07 collection above (also by Agustina Comas). Bonus round: This Tenis Pro clip shows Guga getting a massage (and talking about surfing, his Roland Garros titles, etc.). Later he gets dressed in his own designs. Oh man I was trying to get information about Gustavo Kuerten‘s clothing sponsor (because what blog covering tennis fashion would ignore this Brazilian’s bright-colored style?) and it turns out he has his own line. Along with tennis clothes, the line has beach wear, surf wear, and polo shirts — with a smaller “Mr. Kuerten” collection featuring jeans and polo shirts. As far as I can tell, the women’s line is all beachwear still. Its first store opened in Florianopolis. 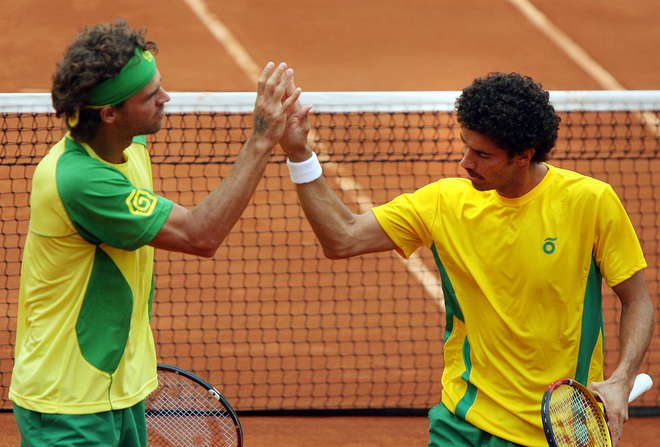 Guga wore Diadora and Olympikus on court prior to the 2006 season and his own line after. You can spot the Guga line by it’s rough spiral logo (seen here on his sleeve). The photos above are pieces from the High Summer ’07 collection designed by artist Agustina Comas for Nakao. It’s laid back, surfer, and preppy all at once. 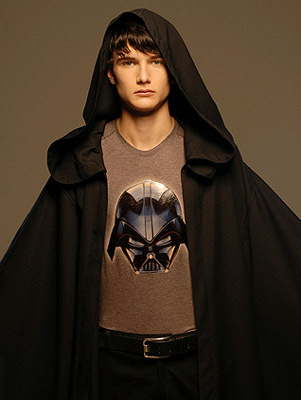 Very Seth Cohen of The O.C.. What do you think of the line? Tell us. Buy: Check out Guga’s official website to purchase the clothes. Now let’s take a peek at the clothes. Polo Ralph Lauren continues as the official clothing sponsor for this year’s U.S. Open. Women’s: The linewoman outfit is on the right. Ho hum. The yellow diagonal stripe on the ballgirl skirt (top row, middle pic) is a nice touch. Other picks: the orange Elena Polo, the Pony tee (with a Big Pony in gold!!) and the sleeveless pleated dress (also with gold pony). Buy: As usual, all these items are for sale. Here’s the link. What do you think of the collection? Tell us. Forget the GOATs for a sec and let’s talk about the HOATs. My top 5, in no particular order (to each his own, folks): Hewitt, Haas, Safin, Rafter, and Clement. Runners-up: Davydenko, Andy Murray, and Youzhny. Who’s on your list? Tell us! Guga lives on: Columnist Charles Bricker lets us know that Guga is still months away from recovery, and likely can’t take advantage of a U.S. Open wildcard. In the meantime, you can enjoy this fan art. Someone loves you, Andy: Andy Roddick‘s still smarting about his quarterfinal loss to Richard Gasquet at this year’s Wimbledon, but he can take consolation in ranking 59th in AfterElton’s Hot 100 list. It’s not just ‘tennis elbow’ anymore: Spine injury can rear its ugly head early on, so teens: be careful! Guillermo Canas and his girlfriend, Brazilian Fabiana Semprebon, posed for Argentinian label Ona Saez‘s latest campaign which raises awareness for global warming. Canas was happy to be chosen for the campaign, he says. And although he’s not a “green” expert, he feels that he can do his part by motivating the masses. Sergio goes gaucho: The background behind Argentinian Sergio Roitman‘s clothing sponsor, No Brand: Roitman’s buddy runs the line, whose goal is low-key promotion of national icons such as cattle (on his bandana, above), Che Guevara, the bandoneón (pictured on his shirt, above), mate (the country’s favorite drink), and Carlos Gardel. Upcoming designs include Guillermo Vilas and Gabriela Sabatini. 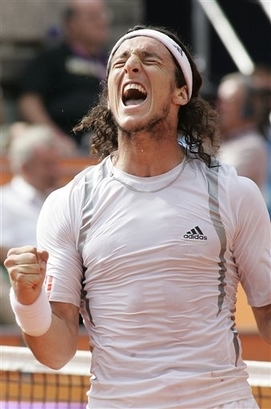 Players like Nicolas Almagro, Filippo Volandri, Nicolas Lapentti, and Ruben Ramirez Hidalgo are all fans of the line. At tournaments, Roitman usually brings extra gear to hand out as gifts. The forgotten Frenchwoman: While Gasquet rolled over Roddick, Golovin orchestrated a peep show, Llodra/Clement cackled their way to the doubles crown, and Bartoli hopped to the final, another member of the armée de gazon at Wimbledon, Camille Pin, bowed out in the first round. She did it wearing an elegant, simple dress from clothing sponsor Lacoste and paired it with a pendant necklace. And at this week’s W&SFG Open in Cincinnati, her dress had an aqua-striped bust. Tres cute! Speaking of the French…: Apparently, Golovin and Bartoli are having a tiff, and all the stress might be catching up with the Wimbledon finalist. Or perhaps her dream run is over, and she’s rejoined us from cloud nine. Those Bangladeshi women are breathing a sigh of relief now that the Polo Ralph Lauren‘s U.S. Open goods have dropped — just in time for the summer hardcourt season. We’ll start with a look at the accessories section. Keep in mind this is only the Ralph Lauren accessories. There are plenty of non–RL merch at the U.S. Open store; we’ll cover those later. You can check out the rest of the pieces here. Which ones are your faves? Tell us.